"Chalofsky's experience and expertise shine through as he takes readers on a journey about how?humanistic organizations lead to increased joy, passion, learning, personal growth, high performance, and bottom-line success. This excellent text ties years of concepts into a coordinated whole?culture, learning, engagement, motivation, community, and work-life integration. Chalofsky provides concepts, practical approaches, and realistic examples for?students, leaders, practitioners, and educators." Neal E. Chalofsky, Ph.D., is a professor and director of the Human and Organizational Learning Graduate Program at the George Washington University. He is also an independent consultant and has worked with a variety of organizations including Mobil Oil, the Organization of American States, U.S. Department of Education, Computer Sciences Corporation, U.S. Chamber of Commerce, the Smithsonian Institution, Ernst & Young, Inc., the World Bank, and Verizon. He is recognized worldwide as an expert in work-life issues and is a regular presenter at national and international conferences. Introduction: Reframing the Nature of Work. Chapter 1. The Elements of Meaningful Work. Chapter 2. Bringing Your Whole Self to Work. Chapter 3. The Meaning Is in the Work Itself. Chapter 4. Work-Life Balance: Managing the Tensions. Chapter 5. The Elements of a Meaningful Workplace. Chapter 6. Values-Based Organizational Culture. Chapter 7. Social Responsibility as Part of a Values-Based Culture. Chapter 8. Employee Engagement and Commitment: The "So What?" Question. Chapter 9. 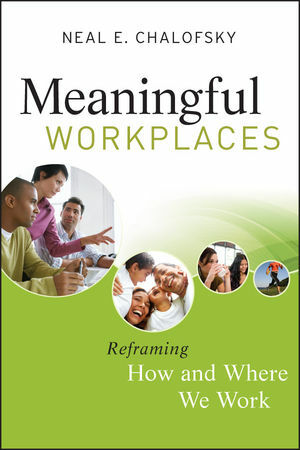 Reframing the Nature of the Workplace. Chapter 10. Integrated Wholeness at the Individual and Organizational Levels.